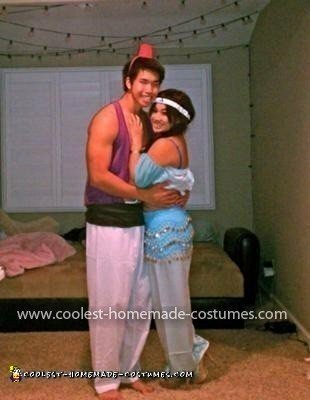 The best thing about this Homemade Aladdin and Jasmine Couple Costume is that it was really inexpensive to make. I bought a silk PJ set from an Asian store for $12. Okay so first, I opened up the PJ shirt and cut it up. I added elastic and turned it into a crop top. I cut the chiffon and used elastic on both the top and the bottom of the sleeves to make them stay on my arm, and then with elastic I attached it my top (making the top was actually pretty hard…but if you know how to use a sewing machine it should be fine). Then, I used a leftover piece from the PJ shirt and cut it, put elastic inside of it, and taped a gem onto the center (you can buy some at Joanne’s but I had some at home). Then I just put it in my hair using bobby pins. I bought a $2 purple muscle tank top from the women’s clearance section at Sears. My boyfriend cut the shirt down the middle and used double sided tape to keep the sides from flapping out. He wore my dad’s old martial arts uniform pants, which were perfect. For the hat, he cut a foam cup in half and used the bottom. Then he used leftover red felt to cover it, and stuck a headband through the middle of it. 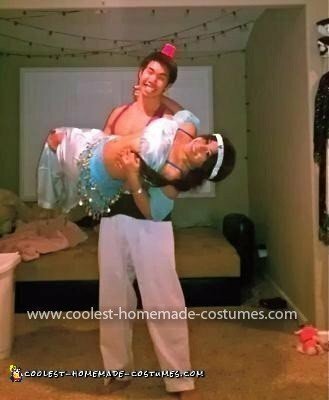 your costumes are SO cute! 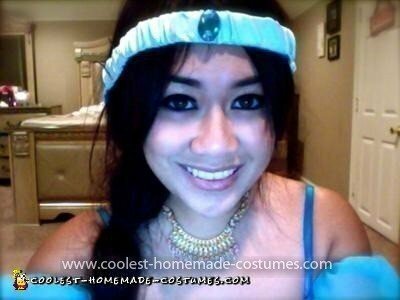 What did you use for Aladdin’s “belt”?